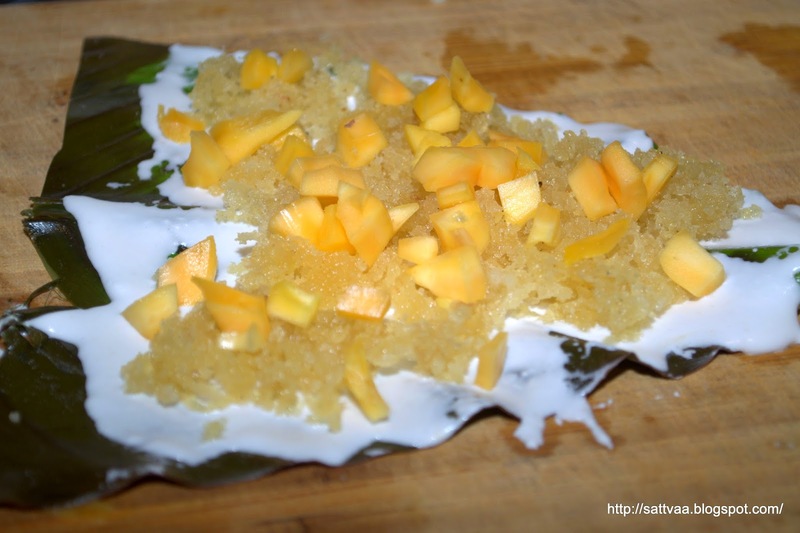 I am back with a regional delicacy from the interiors of Malnadu/Malnad in Karnataka. It is a sweet very unlike anything you may have eaten thus far but has the ability to hook you on the first bite and keep you asking for more :-). I would say this is a very elegant and artistic dessert that is fit for a weekend indulgence with family or to treat friends on occasions. 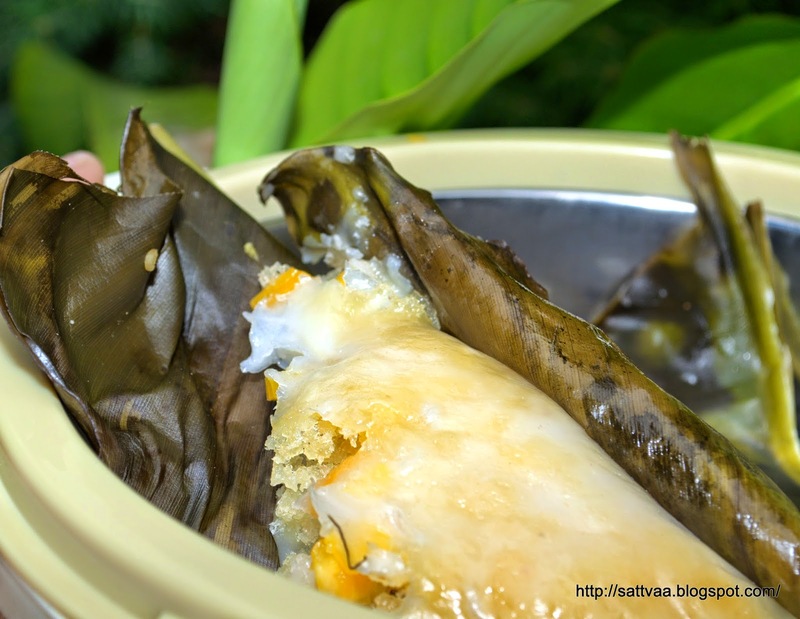 It has a succulent coconut jaggery filling wrapped in a thin layer of ground rice and steamed in fresh turmeric or banana leaves that impart their natural flavors to the dish. 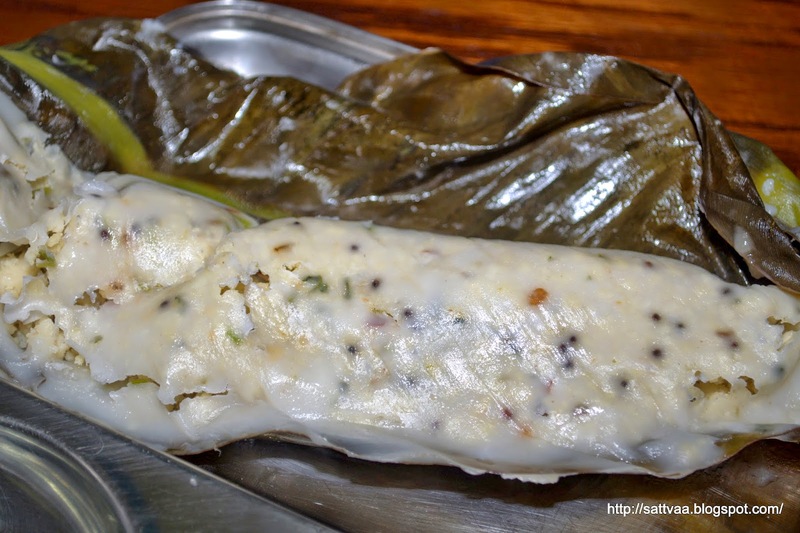 I am talking about Ele Kadubu (~Steamed dumpling made in leaves) or Kai kadubu (dumplings made with coconut) as it is called in the Malnad region. This dish is very popular in South Karnataka/Mangalore region too and goes by the name of 'Genasale'. I have seen this dish also called Pathol/Patholo on the borders of Karnataka and Maharashtra. 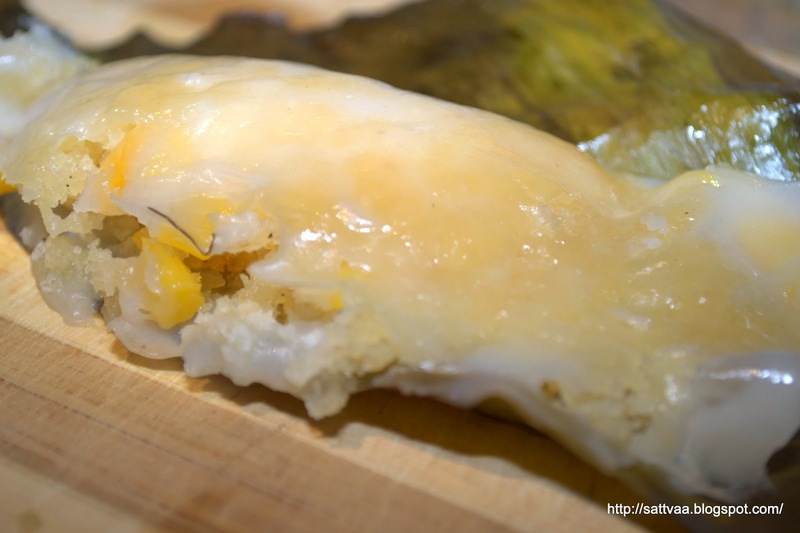 What is so special about this steamed dumpling? The way it is made, there are other similar (from an end product perspective) looking dumplings, I have one of them here. But the Ele kadubu varies from this version in the way it is prepared using a leaf (Ele ~ leaf and usually fresh turmeric leaves are used) and if you are not used to dishes cooked in leaves, you obviously have the question mark on your face now asking, "Why"? Here is why.. fresh turmeric leaves impart a beautiful aroma to the dish and from a very consumeristic goal, it reduces clean up effort since all you have to do is, unwrap the leaf, eat the kadubu, put the leaf into the backyard composter for reuse. Let us back up a little bit to the aroma advantage, this is slightly hard to describe but all I can say is for you to trust me on this and believe that wrapping in turmeric leaves makes the dish totally delectable. I remember having talked about our precious turmeric leaves in Mysore home in one of my earlier posts. Once when doddamma (amma's older sister) visited us, she exclaimed at the fresh green turmeric leaves in the yard and was really surprised at the ignorance of her city bred sister's family. So the sisters got together and made this out of the world dish for us :-). Doddamma lived her entire life in the heart of Malnad and was an awesome cook. But then that was long time ago and somehow nammamma never took to making this often as she made the sweet version the other way. Sometimes, one experience is all it takes for something to make a lasting impression. I fell in love with this kadubu. A couple of years back, while in India, DD & I went to meet up an old collegue of mine. His parents live with him and aunty had made a delicious lunch of vegetable pulav, raita, home made papads, rice, rasam etc and I was already feeling like a bloated boat when she brought us the yummy looking sweet. Something popped and I knew exactly where and when I had eaten it before and without my usual, "I don't really eat much sweets" etc, I grabbed a kadubu. DD was looking at me as if I could cover for her but since she didn't get any encouragement from me and not being able to say 'No' to the sweet lady, she took one bite gingerly. I could tell from the gleam in her eyes and the speed at which she went back for the second bite that we were two peas from the same pod :-). Needless to say, I made aunty explain the how & what of the dish in detail. Like I said, she called it Genasale and told me that banana leaves can be used in the absence of turmeric leaves and mentioned that they add chopped jackfruit pieces when the fruit is in season. We came back home completely satiated. I had this on my list to post for a while now but today is as good as any other. I am hitting my 250th food post with this and so I thought this was a good dish to celebrate with. For someone who started blogging for no good reason other than to record my way of cooking, this number means that I am able to sustain. I know I haven't been going at it regularly but then speed has not been one of my concerns. I am happy to share some stories about the dish with you guys and if some of you try it and like them, I feel I have accomplished what I set out to do. Looking for your feedback as always. While Arishina (Turmeric) leaf gives the best aroma for this kadubu, you can make it with banana leaves which are easier to procure. We have banana plants in pots, started with one and in 2 years they have become three. They are not fruit bearing but I just love the green leaves as they sway happily in the wind. We bring the pots inside during the cold months but they get to enjoy sun shine just like the rest of us during the summer. I used the leaves from my small plant. We got a couple pieces of jack fruit from the store the other day and I decided to make the ele kadubu with jack fruit. The only problem at my home is that DD takes after her ajji (grand mother) and loves jack fruits and they get over in minutes when we bring some home. I stuck a bargain with DD to keep some pieces of the fruit aside for the kadubu and used them the next morning. The jack fruit I got was slightly orange-ish in color, very sweet and extremely aromatic. I also made some savory ones with an urad dal filling just to make it a complete brunch. Yummm! Don't you think this makes for a beautiful Father's day breakfast/brunch? Happy Father's day to all you wonderful dads! 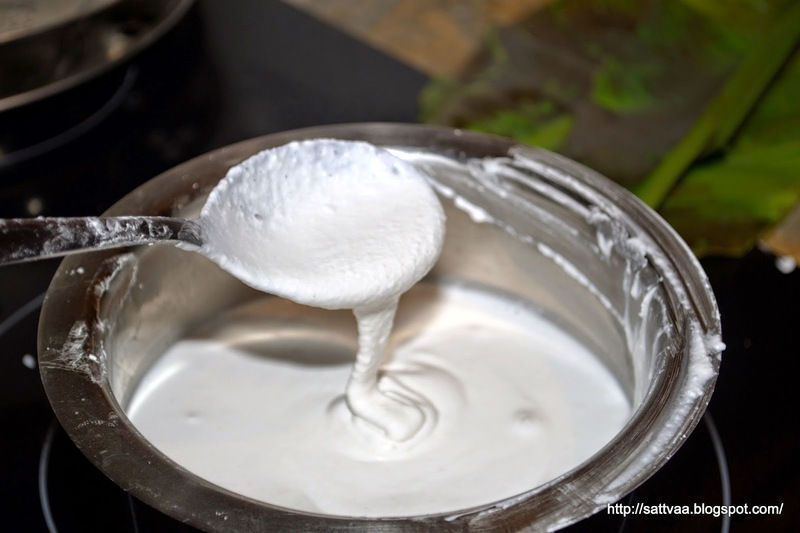 What do you need to make Ele Kadubu? How do you make Ele kadubu? Soak rice for 4-6 hours, longer soaking softens rice further and makes it easy to grind. 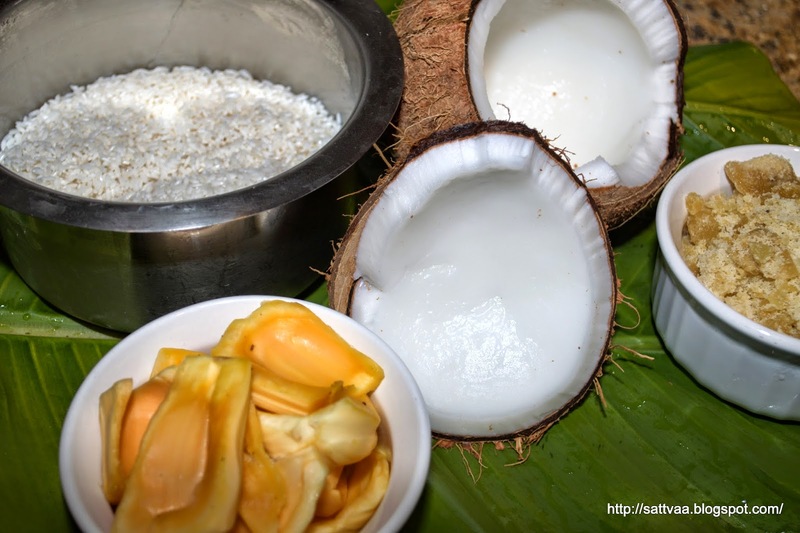 Wash, rinse the soaked rice and grind it with 1 cup of coconut and a pinch of salt until really smooth. When you feel the batter between your fingers, there should be no grainy texture. 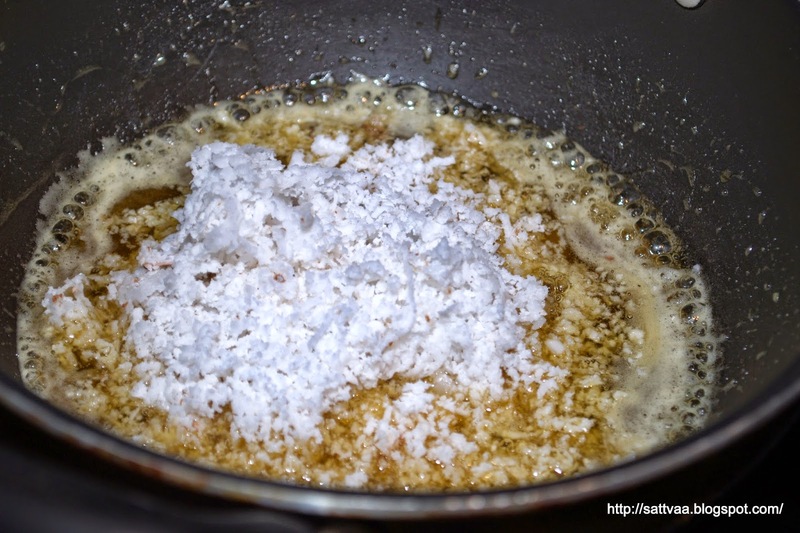 Prepare the sweet filling like so: Heat a pan, add the grated/crushed jaggery and Tsp of water and mix in on medium heat until jaggery dissolves. Add the grated coconut and cardamom powder. Mix well and switch off. 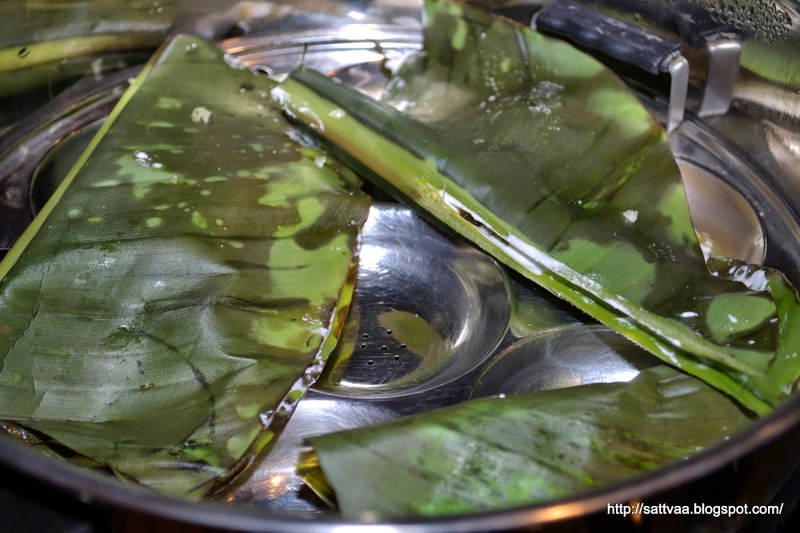 Wash, pat dry the banana leaves and hold them for a couple of seconds on the hot stove. This step not only removes any insects on the leaf but also softens them and makes pliable for folding over. 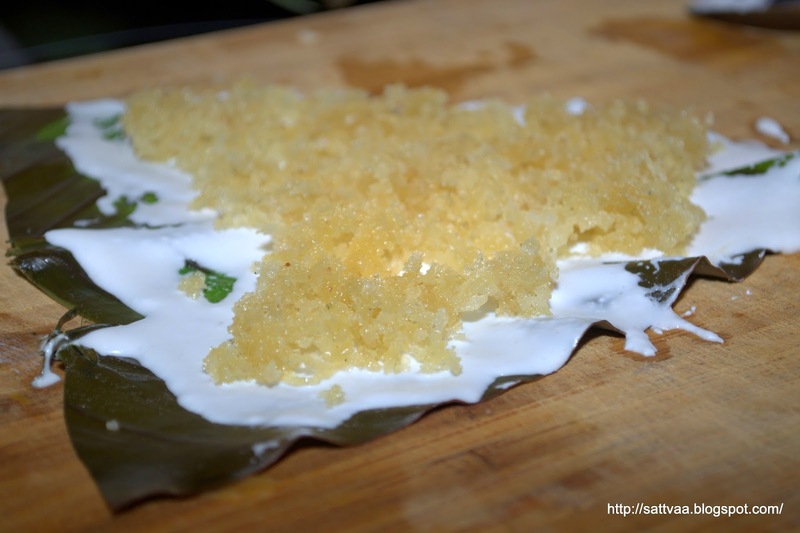 Take a softened banana leaf, lay it on a flat surface, spread a drop of ghee all over on it. Put a Tbsp of the batter on top and spread into a thin layer. Put the sweet stuffing on top leaving a small gap from the edges. If using jackfruit, add the pieces on top. Fold the leaf in the middle gently and put it in a steamer container. I use my idli stand. Prepare the rest of the kadubus in the same way, arrange them in a steamer basket or on idli plates and steam cook for 12-15 minutes or until a knife pushed through the kadubu comes out clean. Let cool for a minute or so after switching off, peel the leaf layer slowly to uncover the yummy kadubu. Serve it with a drop of ghee for a satiating experience. This kadubu is best eaten warm and fresh. The outer layer tends to become hard and chewy if kept for long or refrigerated. 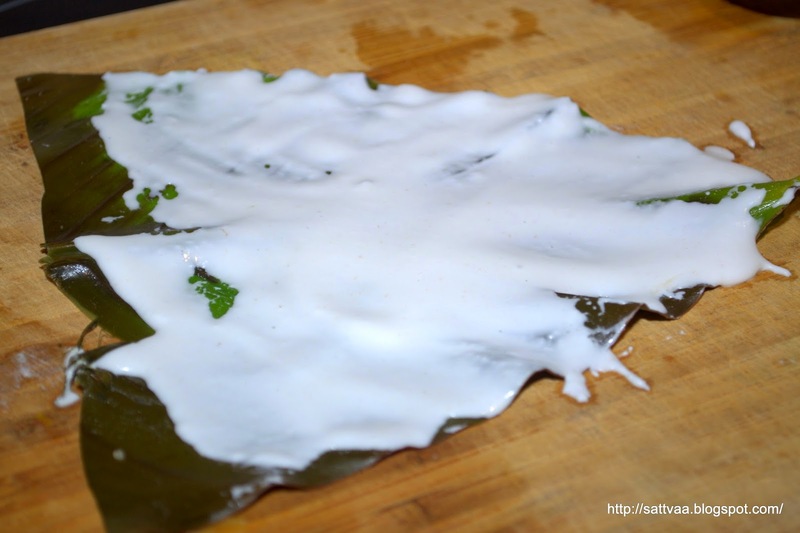 If you make a large batch, do not peel the leaves while storing, re-steam them to warm up just before serving. The consistency of the batter should be thicker than regular dosa batter, it should be easy to spread but not runny so you cannot fold the leaf over. I made a simple khara (savory) filling with urad dal - soak, grind urad dal (or replace it with moong or chana dal if you like that taste better) corasely along with a couple of green chilies and ginger. Steam this for 10 minutes to par-cook. Once cool, crumble the steamed dal. Make a seasoning of mustard, curry leaves and add the crumbled urad dal and roast on low heat until cooked and sorta dry. Add grated coconut, salt to taste. Use this to fill the kadubu for a delicious savory version. You can reuse the banana leaves a couple of times but I would suggest starting with enough pieces so you can steam them at one go. 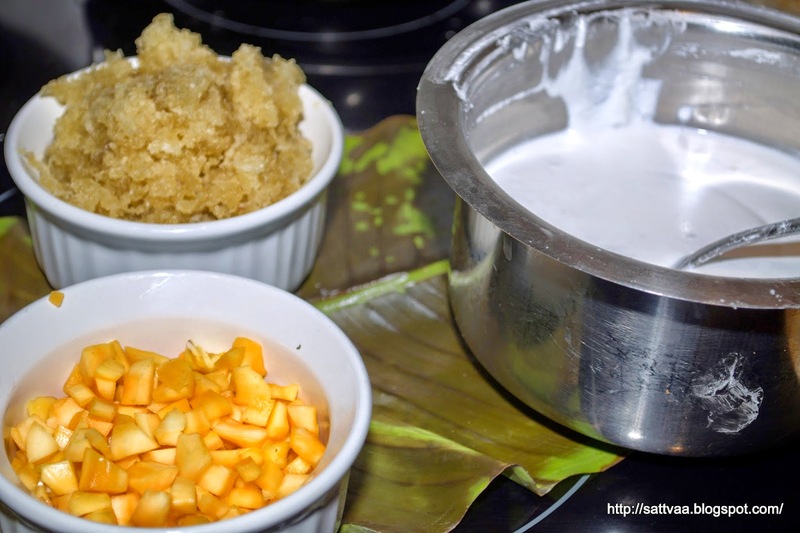 Spreading a drop of ghee on the leaf gives a glossy finish to the kadubu and upps its taste. Never had a chance to enjoy this ele kadubu, that too with jackfruits. Sounds very authentic Nagashree, wish i get just a kadubu to taste rite now. Have been craving for this recipe...thanks for sharing dear.. Thanks for stopping by and appreciate your comments! @pursuit - would love to share the ele kadubu. 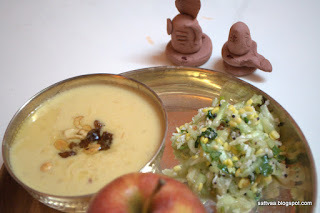 Looking for a special recipe on Sattvaa?